This certificate program discusses how Human Resource Management and the effective contribution of HR practices enhance organizational performance. The modules provide an overview of core human resource knowledge and skills required for a professional HR manager in practice. This is followed by an examination of the development of a robust HR strategy and response, which, independent of geographic region, are required knowledge for professionals practicing HR management. The program then explores how, through demonstrated knowledge, HR professionals can contribute to the delivery of the organizational strategy through a robust HR strategic response, examining a range of HR tools and techniques available to deliver sustained strong organizational performance. HR enables the organization to get the right people, in the right place, at the right time, with the right skills, at the right price. Strategic connections should be made between the organization’s business strategy and the people strategy. Ensuring that HR processes and policies are integrated will ensure they are effective in supporting the achievement of the organization’s strategic goals, and drive strategic value. Developing HR influence at a strategic level will enable HR managers to transform the effectiveness of the HR function. This accompanying article explores key aspects of HR strategy development to enable HR professionals to focus on developing their strategic thinking and developing practical plans for implementing HR strategy in their workplace. Carrie is a recognized expert in her field, appearing alongside CIPD Chief Executive Peter Cheese in a panel discussion on the Future of HR. She is a published author with a successful commercial career covering FMCG, Industrial, Manufacturing and Professional Services, she has a track record of providing OD and coaching programs across UK, Europe, Russia and the Middle East that have met both the individual and business needs. 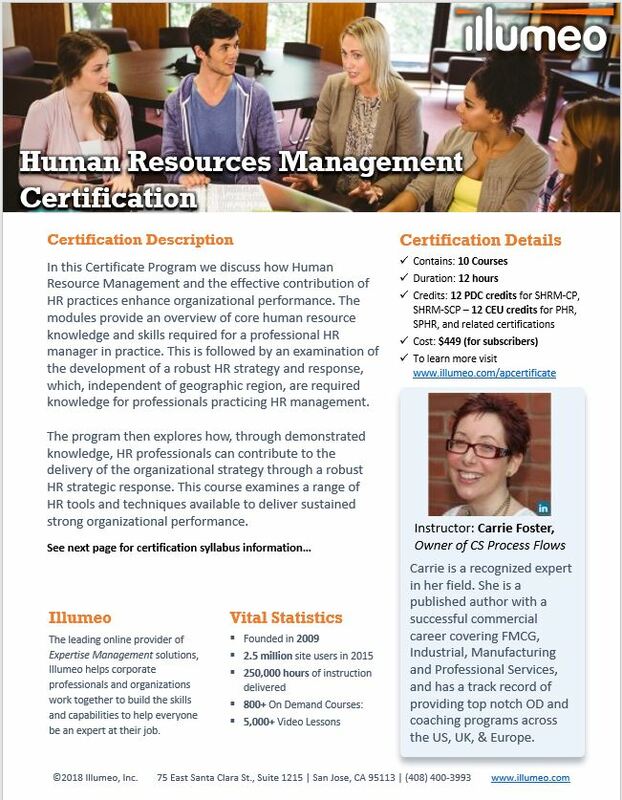 This course examines the role of the HR Mgr. in contributing constructively to the formation of organizational responses to an organization context. This course explores how to make the strategic connections between the organization’s strategy and the people strategy. This course explores how to develop the skills and knowledge needed to deal with HR metrics, management information and HR analytics. This course discusses the basic requirements for the successful management of people in an organization. In this course we discuss the role of HRM in delivering an organizational reputation as an Employer of Choice. This course discusses how to create value from an intangible asset that is measured as a head count cost on the organizational balance sheet. This course discusses the key concepts and controversies in the design and implementation of a strategic reward system. This course discusses both the theoretical and practical framework of two fundamentals of training design. This course examines change management through the application of strategic change management methods and a systems-led approach. This course provides valuable information about how an HR manager can hold authoritative and impactful conversation at board level.